Mike Landay is an experienced Japanese to English technical translator. 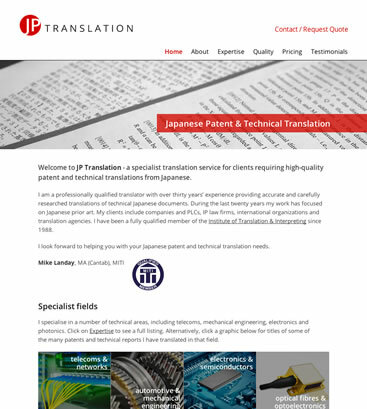 His business – JP Translation – has a great reputation among the community of UK translators and his many high profile customers. He wanted a logo and website that would reflect the attention to detail he applies to his work, but also clearly communicate the services he offers. We created a number of logo candidates incorporating some of Mike’s ideas and worked with him to develop a final logo that reflects his outlook and ambitions for his business. The logo was used to develop a number of homepage mockups and through an iterative process of refinement, we arrived at the final site design, used to build the final responsive website for JP Translation. The site was developed using WordPress, which means Mike can fine-tune the images and copy as his needs evolve.